Thought leaders from across the supply chain will share their insight on a changing logistics landscape at the free-to-attend show next month. 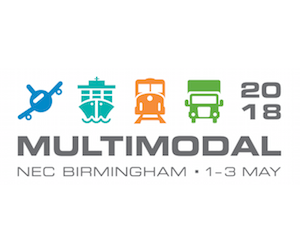 Thought leaders from the tech companies and start-ups revolutionising the logistics landscape will share their insight on how to stay ahead in a changing business world at Multimodal 2018, at the Birmingham NEC from 1st – 3rd May. Digitisation, digital transformation, and disruption will be discussed by innovators including INTTRA, Freightos, Nexiot, and Stowga, during the Supply Chain Excellence Seminars at the UK and Ireland’s leading logistics show. Brexit challenges and opportunities, including a focus on perishables and a session on the Northern Ireland question will be explored by the British International Freight Association (BIFA), Agency Sector Management (ASM), the Port of Dover, and Eurotunnel. “We are living through an unprecedented period of change and disruption, and with all of the challenges and opportunities that inevitably follow, keeping up to speed with developments can be hard,” said Robert Jervis, Logistics Portfolio Director, Clarion Events. The Freight Transport Association (FTA) has once more teamed up with Multimodal for a day of seminars including discussions on airfreight and port operations and will bring a panel of experts to look at the global implications of Brexit. The Chartered Institute of Logistics and Transport (CILT) and the United Kingdom Warehousing Association (UKWA) will also host sessions exploring topics from the warehouse of the future to attracting new talent. The fourth Freight Transport Association (FTA) Multimodal Awards take place on the 1st of May, with over 800 VIPs expected to attend a gala dinner at the VOX Conference Centre. The UK and Ireland's premier freight transport, logistics and supply chain management event.